October 26 is the National Mincemeat Day. 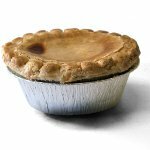 This food holiday is dedicated to a type of pie filling which is popular in English-speaking countries and has been around for centuries. The word “mincemeat” derives from the term “minced meat” which means finely chopped meat. Originally, mincemeat was a mixture of fruit and meat, hence the name. Early mincemeat recipes included wine or vinegar which had been replaced by distilled spirits by the 18th century. Spices were also added such as cinnamon, mace, nutmeg, and clove. Modern mincemeat does not necessarily contain meat, though some recipes do include beef or venison. It is a mixture of chopped dried fruit, spices, and distilled spirits such as rum or brandy. Sometimes beef suet is added, though it can be replaced by vegetable shortening. Some mincemeat recipes contain citrus peel, chopped apple, candied fruits, nuts. Mincemeat is most often used to make mince pies or tarts. Mince pies are usually served during the Christmas holiday season. In some parts of the United States, they are also a traditional Thanksgiving dish. To celebrate the National Mincemeat Day, you can cook a delicious mince pie. Think of it as a rehearsal of your Thanksgiving or Christmas dinner.